We are DONE! For the most part. There are still little things here and there, and the inspection hasn’t happened yet, but our major projects are done and the house is hitting the market tomorrow. No tree’s present on property at time of purchase. 10 flowering pear tree’s planted on the east side of the property in November 2008. These tree’s will eventually provide a natural privacy barrier if trimmed correctly. They are spaced roughly 22′ apart. 1 Oak tree was planted on the south east corner of the property in the Spring of 2009.
high growth rate of Willow tree’s this has already started to provide a natural barrier from the southern sun. 1 “unknown” tree was planted on the north central portion of the property. It was a seedling from a neighboring tree. It is now almost 2 yrs old and thriving well. It will soon match the neighbors trees of the same breed. The bushes were moved from alongside the walkway to in-front of the south main windows. and front east side of the home. Colors range between the bushes, as do flowering seasons. These will provide a vast array of colors throughout the year. New bark has recently been laid. In January 2010 a new aerobic compressor pump was installed, replacing the failed pump. At the time of purchase the kitchen had outdated, mismatched, cheap, and only partially functional appliances. At the time of purchase there was only an ‘over the oven’ vent. No microwave. 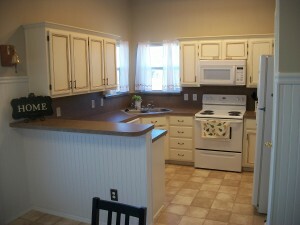 Recently new, updated, matching, white appliances were purchased and installed. They work Great! 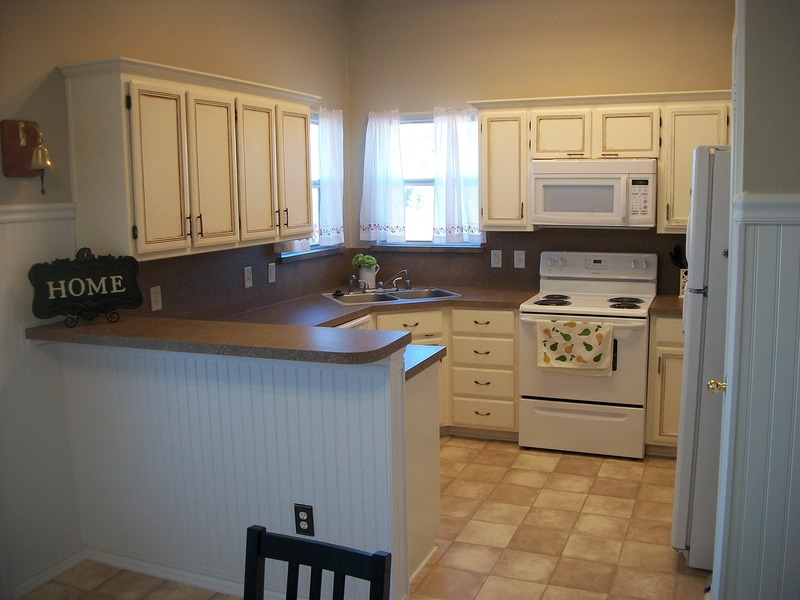 These appliances include a dishwasher, stove, and overhead microwave. At the time of purchase the cheapest (and ugliest) laminate counter tops were in place. Recently the counter tops have been refinished with the “Miracle Method.” They have a new durable surface. Which matches the kitchen remodel and updates the kitchen dramatically. This was a costly upgrade. 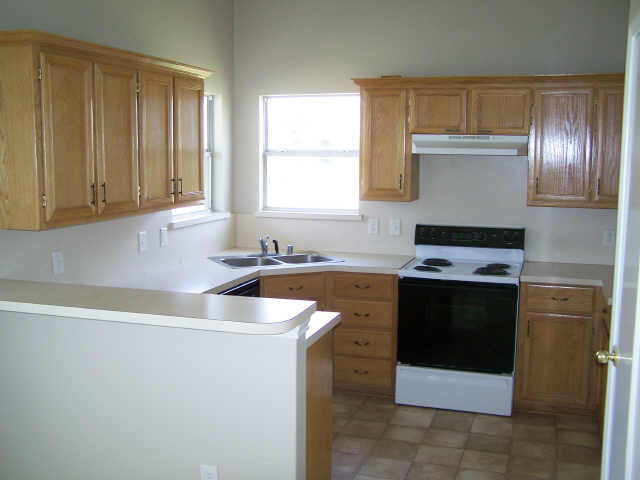 At the time of purchase the kitchen had builder grade cabinets with a poorly applied polyurathane sheen. The finish was peeling, cracking, and looked very poor. Recently all cabinets have been refinished, painted, and updated. A new sink and faucet were recently installed in the kitchen. We have also installed new “bead board” in the dining area which is applied over the existing drywall. They are finished off with highly placed chair rail molding, a custom shelf, and other ornamental molding. In general the kitchen looks completely different than at the time of purchase. It no longer looks like the kitchen in a “starter home” but rather one you would find in a much higher grade home. Finally, a new water heater was installed this past summer. Below are all the photos. The first 12, and the last 3 photos are of the house when we bought it (I couldn’t get them in order). The rest are of the house as it is now. As usual click to see it larger.